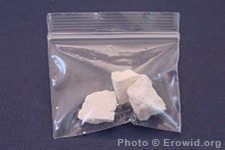 Cocaine is a common stimulant derived from the Erythroxylum coca plant. It is best known for its massive popularity in powdered and freebase (crack) forms. June 2017: NYC Health Department announced the presence of fentanyl in cocaine is contributing to an increase in drug overdose deaths. Starting in 2009, cocaine cut with levamisole (a veterinary and human dewormer) began being increasingly reported and resulted in numerous hospitalizations and a few deaths across the United States. The DEA reported that as much as 1/3 of all cocaine in the US is tainted. Researchers show that in invertebrates levamisole appears to synergize with cocaine, increasing effects. The percentage of samples tested by Erowid's DrugsData testing program that contain levamisole dropped significantly beginning in January 2016. Will rats really keep taking cocaine til they die? What is the LD-50 of cocaine? eat enough or a big wild man who has cocaine in his body."